Construction on Wollaton Hall was completed in 1588 after 8 years of building work and a huge amount of money for a man named Sir Francis Willoughby. It is believed to have been designed by the famous British architect Robert Smythson who designed other impressive mansions such as Hardwick Hall. Willoughby was a wealthy coal mine owner and paid for the Ancaster stone used to build the hall in coal from his pits, aswell as paying his workers with coal. The Willoughby's lived in the hall up until 1881, but due to changes in the area decided to move elsewhere and let the property out. The Willoughbys who lived in the hall at the time were quoted saying about the position of the hall, "too near the smoke and busy activity of a large manufacturing town... now only removed from the borough by a narrow slip of country". The property was rented out until 1925, when it was bought by Nottingham Council, who opened it as a museum the same year. Today the hall is still open to the public as a museum and has also been featured on various movies, such as scenes from the batman film, "the dark night rises" were the hall was shown as Bruce Wayne's manor. 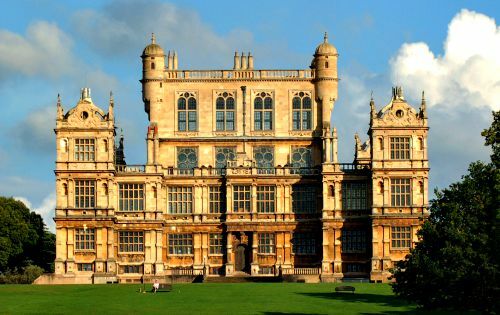 Wollaton hall has many ghost stories attached to it, with everything from tales about demons to strange psychic phenomenon. But most of this is likely due to the "camp fire" effect since its been around for so long and certainly looks the part of a haunted building. But there are a few stories which seem to come up again and again, with the most well known of these being that of room 19. On the upper floor where the room is located a strange orange glow has been seen beaming out of the window. This has been seen and captured on film a number of times with no one being able to come up with a reasonable explanation, as well as that when the glow is seen if someone were to enter the room it always stops before they open the door. The main tale attached to this is that it is the ghost of Lady Jane Middleton, who was confined to the room after being partly paralysed follow an accident on her horse. She is believed to have died in that room and most people seem to link her spirit with the strange orange glow. As for other ghosts there isn't really any explanation as to who they could be, but they certainly like to make themselves known. They manifest themselves in the form of apparitions which have most often been seen in the ball room at the top of the building. There is also said to be a small cave under the hall which can be accessed through the wine cellar. There are to many stories about this cave to mention but it is definitely a hot spot for ghostly activity in the building, with people making claims such as being touched or shoved by unseen hands here.